This week is full of caramel deliciousness. I have three different recipes that will stand on their own or combine into one amazing confectionery creation. 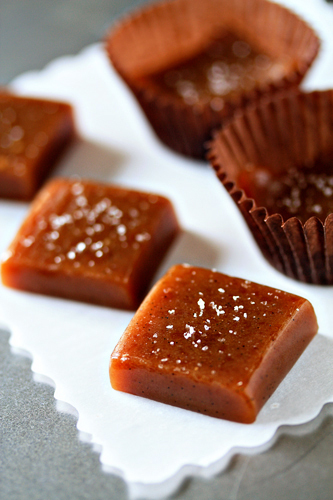 First on the agenda are simple Fleur de Sel Caramels that will make you weak in the knees. Although I thoroughly enjoy consuming candy, I can’t make the stuff to save my life. Trust me; I have tried…numerous times. I always end up blaming the thermometer…because it couldn’t possibly me, right? Well numerous specialty thermometers later, candy is still not my forte. However, when I saw this salted caramels recipe on Annie’s Eats back in December, I thought they appeared simple enough for someone with zero candy making skills like myself. Well, I was right, these buttery caramels are rich, smooth, and insanely tasty. Be careful…these are so incredibly addictive that I’m betting you could easily eat yourself into a caramel coma. 1. Line the bottom and sides of an 8-inch square baking dish with parchment paper. Lightly butter the parchment. 2. In a small saucepan, combine the cream, butter, vanilla extract, vanilla bean seeds, pods, and fleur de sel. Heat over medium-high heat and bring to a boil. Remove from the heat and set aside. 3. In a medium saucepan, combine the sugar, corn syrup, and water. Heat over medium-high heat, stirring occasionally until the sugar is dissolved. Boil, without stirring but gently swirling the pan occasionally, until the mixture is a light golden caramel color. 4. Remove the vanilla bean pods from the cream mixture and carefully stir the cream mixture into the caramel – the mixture will bubble up, so pour slowly and stir constantly. Continue simmering the mixture until it registers 248˚ F on a candy thermometer. Immediately remove from the heat and pour into the prepared pan. Let cool for 30 minutes, then sprinkle lightly with additional fleur de sel. Continue to let sit until completely set and cooled. Cut into 1-inch pieces (a buttered pizza cutter works well). Wrap the individual caramels in small pieces of wax paper, about 4-inch squares. - I stored my caramels in the refrigerator. Leaving them out at room temp made them a little more pliable than I wanted them to be. fleur de sel is the one this i asked for for Christmas that i didn’t get…probably because my family KNEW i’d try to make stuff like this and they’d have to eat it all! not that it’s a problem, but i think at that point they were all “sweeted” out! These look amazing! I’ve been wanting to make my own caramels for a while. Mmm. Dying to try these ever since I saw Ina’s! Delicious! We too are EXCELLENT candy eaters, but do get a little timid when we’re trying to make it ourselves. Although we think we could handle this…yummy! The caramel looks fantastic!…. really yummy. Amazing. I love caramels with the salty suprise! I cannot under any circumstances makes these…I will sit and eat the entire batch all by myself until my teeth hurt and my tongue is raw. ok, maybe I will make them…things will be different this time, right? Glad you enjoyed these as much as I did. Thanks for the link – love your blog! I really need to try my hand at making these – I just love the salty-sweet combination of flavors! I really need to try my hand at making caramels. These look super tasty, Jamie! They look perfect. Love the sprinkling of salt on top! These look dangerously delicious! I think I’ll definitely have to give them a try. Like bread baking, I think making homemade candies is one of the most sensual and rewarding tasks one can accomplish in the kitchen. Looks like you nailed this one. Yum! These look fabulous, I have always wanted to make Caramels. I will have to give them a go soon. I use a recipe from Epicurious that comes out perfect every time! I use a Cyprus white flake sea salt that is so pretty. The grains are like miniature pyramids and they look beautiful and give a nice crunch to the candy. I made at least 10 batches this Christmas. They are out of this world! I’ll have to give yours a shot. They look YUMMY! Love that you can see both the salt and the vanilla bean specks. I would probably eat the entire batch by myself. They look very professional. I’ve always wanted to try making some of these myself, I’ll need to store your recipe while I work up the courage! Your caramels look gorgeous in that picture! Caramels are my weakness. What a delicious recipe! Aaaah, that sweet and salty combination is the BEST! These look beautiful. I am a caramel-a-holic.. If there is such a thing. Yours look AMAZING!! I made some caramels for this past holiday season too. My first time in candy-making and it was a raging success! These look wonderful. Caramel is my favorite, can’t wait to give these a try! These are decadent little treats, that look picture perfect! What a great recipe, these look addictive. Gorgeous! Can’t wait to try these sometime! I tried to make these last night but my caramel never hardened. Any advice? Does anyone know if I can sub in Vanilla Bean Paste for the seeds? Will the caramels still turn out? I got directed to your blog from Ree’s most recent blog post. These caramel squares look absolutely delicious, I have to try them out!! Thanks for sharing! Does anyone know how long the caramels will keep? I’m considering making these as wedding favours, but would like to make them a month or so ahead of time so that I’m not making and wrapping candies the week before my wedding. These caramels become really pliable when left at room temperature, so I don’t know how well they would keep. Sorry I am not more of a help! Best of luck with your wedding plans and congrats! Do you think i can sub in agave for the corn syrup? or is there a different better sub I can use? Thanks for stopping by, I have never made that substitution, so I can’t comment as to if it will work or not. Your blog has been inspiring me for the past couple years- it just simply beautiful and the recipes are genius! I tried making these caramels but I replaced the vanilla bean for paste. The caramel turned out and tasted wonderful but it became so hard that I couldn’t cut into beautiful squares. Instead I got candy bark like pieces. I let it sit to cool before cutting for about an hour or two- did I wait too long to cut? Thank you! Thanks so much for the kind words – I am so please to hear that you enjoy the site. If your caramels turned hard, that typically means that mixture was cooked for too long and got too hot. Hope this helps! Hi Jessica! My friend had this same problem. Though her recipe called for a higher temp than 248, you may have hit that on your candy thermometer but your thermometer could have been off. Just a suggestion. Try boiling some water and using your candy thermometer to see how close to 212 it is. Mine runs low when I tried this test. So I compensate a few degrees when making marshmallows, fudge and caramels. Hi. I am new to this site, but love the sound of the caramels. I have been hunting for a recipe that you can bake with to make a firm yet gooey caramel, like you would get in a chocolate bar. Would this work or do you have another recipe or adjustment. I think this is going to be one of my new best sites for visiting!! You can definitely dip these in chocolate. They are semi-firm meaning you wouldn’t want them to sit in a warm area. I like to keep them in the refrigerator until just before serving. I hope this helps. I’m hosting a brunch at a fancy restaurant for my girlfriends this weekend. I made these to put in their thank you for coming goodie bags. Smells amazing and I know they’re going to taste the same. The caramel is cooling as I type! Can i use this recipe for caramel buttercream ? Do you know how long these are good for? I’m making some goodies to send over to the UK and shipping is about 10 days. Will they be good that long? These caramels should be fine during shipping and still be plenty fresh. I hope this helps. I absolutely love your recipe for this Salted Caramel!!! But I am rather ignorant when it comes to some of the ingredients in some of these recipes. And this ones got me going, ” FLEUR-DE- SEL ” huh??? Does this mean you throw a little French man in the mix?? HAHAHA. So really, where in the grocery store do I find one of these? Could someone be so kind as to help me with this??? PLEASE????? THANK YOU SO MUCH!!!! P.S. You have some wonderful recipes here, I can’t wait to try a few!!! Hi, Marilyn! You made me smile! Fleur de sel is a hand harvested salt from France. Check at Whole Foods and Williams Sonoma; they should have it. Let me know how it goes! I hope you have a great day! This was my very first attempt at making candy of any kind and it was so simple. My family couldn’t believe that I made this from scratch. Thanx for a wonderful recipe that I will be making for Christmas presents this year. And also again for the family, they can’t get enough!!!!! I’m so glad to hear that, Valerie!